Shhhhh! They are Talking about us. I woke up and as a routine checked my mail. It was early morning and I was wondering how on earth these many new members registered today. And then came Renu's sms with the reason. DNA published and article about us. Looks like media is also noticing. :) Except my personal crib that they mixed my name with Preeti's surname (Notice the red line in the image), everything looks fantastic. Click on Settings (on top-right of your screen). Click on Web Clips Tab. Check Show my web clips above the Inbox, if not alreadfy checked. In this way latest poems of p4poetry website will appear on your gmail clip bar, as shown in the pic. The passion just crossed a milestone of 100! Just 18 days from the launch and we already have 100 members!! Since yesterday Renu had been sending us messages on gtalk stating the memeber count! It's like counting someone's last breath, albeit with excitement ;) It felt like we'd choke with excitement when we reach 100! The smile on my face extends for a mile. I think I'll have to get used to maintaining this smile and enthu for this is just the beginning, and a great one! Renu, I'm waiting for you to message me on gtalk about the milestone :) I know you want to :P even thought we all are aware of it! Sorry Vikash, for being woken up just to sms all the members and for adding the flash on the website main page. And Raj, I hope you've heard the news too! How weirdly are you behaving? Congrats to each one......10 May will be a huge celebration!! All four of us met at R&R's place this sunday. We discussed many website related things and slices from our lives. We dropped some ideas, thought of some new ones - ya! In one word, it was 'productive'. So much to catch up with....and celebrate! It feels great when your plans begin to take shape on this Earth (fine....cyberworld!!) We all shared a common dream of promoting poems and with Renu's inputs as our initial foundation, everything else just fell into place. And then, our baby was born!! Vikash was a proud mother (haha) after delivering this new kid to the cyber world! He has sleepless nights-still does- but his passion for poetry drives him all the way!! Renu and Raj despite their busy schedules gave in their inputs while working on PR. Renu, truly thanks to you for initialising this whole process!! And Raj, despite your silence, thanks for being their and passing on your inputs through Renu :D! And I, wish I could say I was there all the time! Having no technical skills unlike Vikash, and being busier than Raj and Renu thanks to my graduation exams, I just got in my suggestions for the overall website. But I was elated to work on the forum and be my own boss, after all, like some would say, I'm the mother of forums!! Our 5oth user just registered. Yesterday we got about 380 page views. and the day before 892. The day we launched, we got 98 absolute unique visitors. Average time spent per user is 10 minuets. 54 visitors spent more than half an hour time. 159 spent more than 10 minutes. We have 50 visitors who visited more than 25 times. 29 visitors saw more than 20 pages. 91 visitors saw more than 10 pages. We got visitors from 14 different countries. 3 people visited from United Arab Emirates and spent 22:30 minutes on avg. People from Italy spent 15:04 minutes per user and saw 10.5 pages on avg. Indians visited 6.3 pages/visit and spent 11:30 minutes on avg. Not bad for starters. Eh??? All thanks to our visitors and users. We rely on google analytics for these data. And amazingly, though I have been insanely busy...I am now finding the time to write poetry once again! Well...didnt get a great response....but it was the starting point for our website. Age difference melted bcoz of our obvious passion for poetry.....and we were blown by their IT finesse.And when they voiced about starting our own website.....voila ! thats what we also wanted. The next meet we had was just the 3 of us.....Vikash,Raj n I .And over coffee ,we registered our domain. The next day,Vikas told me to go to our site and we already had a skeleton !!! And thats what we did !! Vikash has been awesome....absolutely awesome.He has designed everything singlehandedly. Preeti blew our minds with the forum. 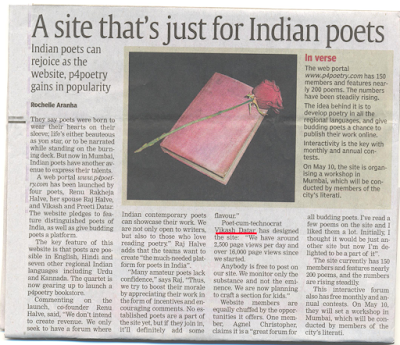 Our membership in 2 days is already more than that of Mumbai Poetree ....and it feels so good !!! Theres going to be a lot of work as our membership increases but its going to be worth it. Its like seeing our own baby grow . Well! p4poetry.com was almost a dream just before today. At times, I doubted myself. I was not sure if I can handle a real task like this. But finally! Its in shape now. If you are a newbie techie then you might say that all I did is to take wordpress codes and plugins. (this is what I was thinking before I actually started working). But, once you actually start doing it, you will realize that even searching for the right plugins, assembling them, customizing them according to your needs is a huge task. I thought that I'll take a break just after launching. I'm worried if we will get good enough response or not. That is it from my side. Raj and Preeti were pretty busy for last few weeks. But, its amazing how they managed to keep track of everything. I hope we all will see Raj's draft of press release soon enough. And Preeti's work for the p4poetry forum was...umm...No words. I'll say she is the mother of it. I don't want to say anything about Renu. All we talked for last few months is about p4poetry. Everytime she had a new idea. How can she think so much about it? well! she herself will write someday about it. Hoping to get good response.